Were the duo Hasley and G-Eazy in trouble long before they set their ways apart? A while before their breakup the couple was spotted with their beau Machine Gun Kelly. See pictures of their jointure here. Already moved over Ariana Grande, seems to be glad in her life as, Hasley has left no tears in her eyes, as she is already moving on. 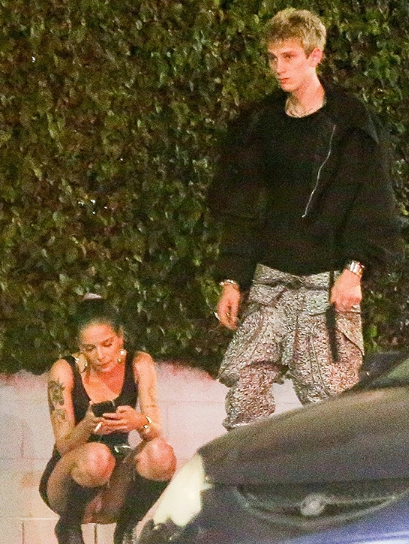 The American Singer bad at love was clicked with her ex-boyfriend Machine Gun Kelly on June 28 just after a few days of her evacuation with boyfriend E-Gazy. The pictures portray Hasley and Machine walking in a jolly mood with the American singer and actress in a tight black dress that well paired with the boots of Machine. Howbeit Machine also looks dope in the back bomber and balloon lowers. It may be that she had reunited with Machine for some purpose. However, we wish both of them a good luck!